This tour is designed for those who want to step out of the gym and into nature's playground! We warm up with light a paddle on the Hudson River. Then it's time for some fun in the sun with Reyna Texler, an NFPT Certified Personal Trainer, for a fat-blasting, full body, beach workout! 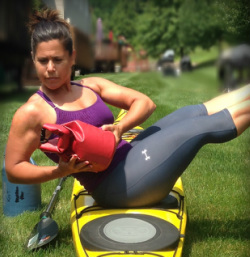 Be prepared to get wet and use your body weight and some of your paddle equipment for a fitness experience that is sure to fire up your metabolism. Afterwards, cool down with a refreshing swim and refuel with some light snacks before paddling back. This tour is open to people of all fitness levels. You will be able to work at your own pace in a supportive and encouraging group setting. It is recommended you bring a towel, additional water, and appropriate shoes to change into for our fitness experience on the beach. If you would like to fill out your paperwork in advance you can find our waiver here.